Singh Vishwadeep Assistant Professor, Department of Anaesthesiology, Sri Ram Murti Smarak Institute of Medical sciences, Bareilly, India. Karki Geeta Associate Professor, Department of Anaesthesiology, Sri Ram Murti Smarak Institute of Medical sciences, Bareilly, India. Mowar Ashita Assistant Professor, Department of Anaesthesiology, Sri Ram Murti Smarak Institute of Medical sciences, Bareilly, India. Singh Ankita Medical officer, District Hospital, Bareilly, India. Pahade Akhilesh Attending Consultant, Department of Anaesthesiology, Rajiv Gandhi Cancer Institute, New Delhi, India. Singh Lalit Professor and Head of Department of Pulmonary Medicine and Crtitcal Care, Sri Ram Murti Smarak Institute of Medical sciences, Bareilly, India. 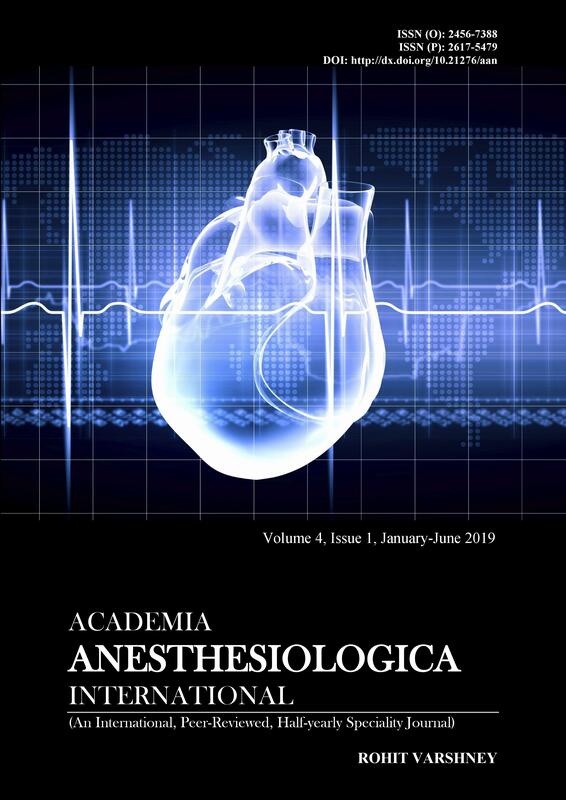 Background: There is a growing evidence to suggest that regional anesthesia has an important role to play in the management of patients undergoing laparoscopic procedures. Subjects and Methods: We compared spinal anesthesia with general anesthesia, for laparoscopic cholecystectomy in 100 ASA grade 1 and 2 patients between the age of 18-50 years, divided equally into two groups given either GA or SA. The groups were compared by hemodynamic variables, intra operative events, post operative pain, operative conditions for surgeon and complications if any. Statistical Analysis: Data summarised as Mean ± SE. Groups were compared by Student’s t test , (ANOVA), Newman-Keuls post hoc test and chi-square (χ2) test. Results: Hemodynamic comparison showed better hemodynamic profile in group SA than group GA. The time of rescue analgesia was comparatively higher in SA than GA. The no. of diclofenac used lower comparatively in SA than GA. Comparing the intra operative events of two groups there was higher shoulder pain in SA as compared to GA. However, hypotension was found similar between the two groups. Post operative side effects showed higher pruritis and urinary retention whereas lower sore throat in SA as compared to GA. However PONV and headache were found similar between the two groups. There was higher surgeon and patient satisfaction in GA as compared to SA. Conclusion: We concluded that laparoscopic cholecystectomy can be conducted safely under Spinal anaesthesia with excellent recovery and high degree of satisfaction in selected patients.